Juan J's is a LA based producer of pre-packaged Mexican style creamy desserts. They make three styles of flan, along with rice pudding, a few different gelatins (some with fruit), and a custard dessert (jericalla - a fascinating sounding cross between flan and creme brûlée). I discovered Juan J's in the refrigerated section at my local corner market, Bayside Market, next to the pre-made Jello and nasty Kozy Shack puddings. I didn't really have high hopes, since it was a packaged product, but I sure do love my puddings, so I gave it a try. I'm so glad I did! 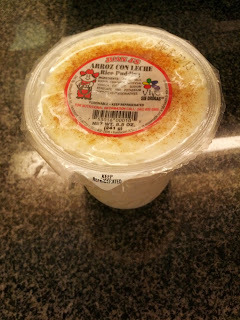 Bayside Market only carries the rice pudding and flan, and since I don't tend to like flan I didn't try that, but I'm now on a quest to find other places that sell Juan J's products, particularly the jericalla. Even if it is a cross with flan, my love of creme brûlée makes me very interested. If you spot this around San Francisco, let me know! The rice pudding didn't really look like much. Just pre-packaged rice pudding. How good could it be? The answer: it was astonishingly good. The top was covered in cinnamon, a really flavorful strong cinnamon. The pudding itself was creamy. It wasn't too thick, it wasn't too thin, just enough liquid to make it a pudding, not at all runny. It was sweetened, but not too sweet. I think there was some vanilla as well. The rice was well cooked, not too mushy, not too al dente. I was ready to have to doctor it up, adding some fruit compote, or other spices, or nuts, or something to it, like I have with so many other rice puddings I've tried. Since I had so many ideas on how I'd "fix it", assuming it would be bad, I had a few lined up to try (including a fresh berry compote), and I did try some that way, but quickly regretted it. It really was just perfect as it was. I should have left it alone. I tend to order rice pudding whenever I see it on menus at restaurants, since I can really love it, but usually I am disappointed. This didn't suffer from any of the common ailments, like by the incredibly watery version from Lahore Karahi or the goopy, flavorless one from Camino. It was even better than the decent baked one from Tuba, or the elegant one at Cyrus. Yes, this pre-packaged one was better than any restaurant version I recall having. Bayside Market is a corner store and deli, located just a few blocks from my house. It is part of the RJ's Market Chain, which also includes RJ's Market in Levi Plaza and Rincon Market (a few blocks in the other direction from my house). The locations are all a bit different, but are corner stores tailored to the SF neighborhoods in which they are embedded. For example, they carry an impressive line up of higher end chocolates, the cream cheese selection is small but of course includes a non-dairy option, and their liquor selection is quite large given the overall store size. They also all have delis with assorted pre-made salads, they make sandwiches to order, and have huge salad bars. 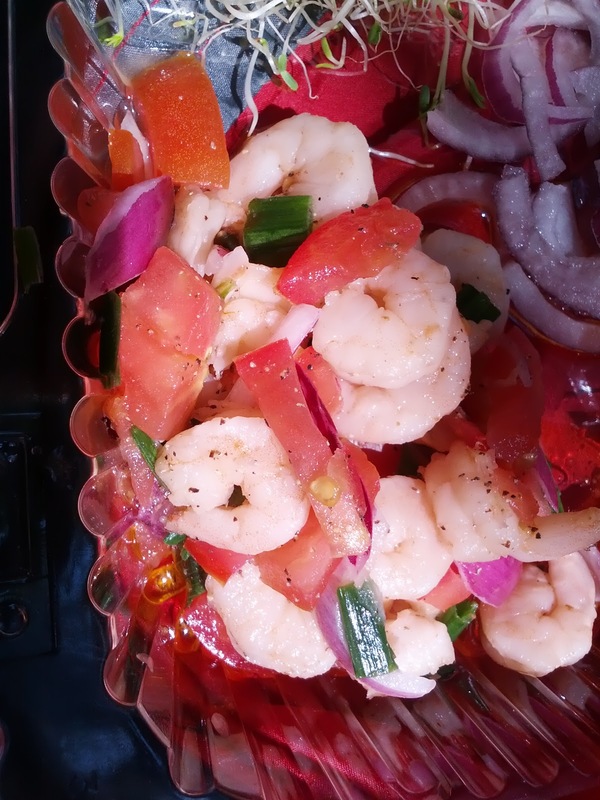 I needed some easy cold dishes for take-out, and I've kinda been craving deli salads, so I checked out the deli and the salad bar offerings. Over a few visits, I've tried many of their salads. All seemed to be fresh and made with quality ingredients, but some of the flavors didn't work for me. But others were great. It seemed very hit or miss. I wish they were the sort of place that let you sample before buying, since they varied widely! Thai inspired pasta salad. $8.49/lb. I was told this was a Thai pasta salad. 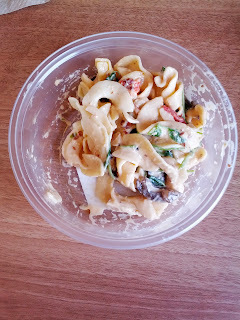 It seemed to have egg noodles, mushrooms, pea tendrils, roasted red peppers, and almond slivers in a peanut based sauce. I guess the peanut sauce is what made it Thai? The noodles were decently cooked, a bit mushy, but not bad. The mushrooms were wild mushrooms, not just button mushrooms, and they added a good heartiness. Roasted red peppers added good flavor, far better than regular raw red pepper. The almonds gave a good crunch. I just love pea tendrils, so I was thrilled to see them instead of more classic spinach for the greens. I was very surprised to see them using an expensive ingredient like that in the pasta salad, as it was wilted and lost in the dressing. I wish it was allowed to shine more! Speaking of the dressing. I didn't really like it. Sorta peanut flavored, but not really. Creamy, but ... I dunno. Something didn't come together for me with this. I really appreciated the mix of ingredients in here, the use of wild mushrooms, roasted peppers, and pea tendrils, but sadly, I didn't like the salad. My least favorite, and I didn't even finish it. Priced fairly high per pound at $8.49, which I guess makes sense given the pea shoots? I was a little surprised though, as it was higher priced than most of the salads, including the seafood options. This came out of the salad bar. The shrimp were small size, but nicely cooked, not rubbery, not fishy. The seasoning on them was really impressive, strong salt and pepper flavor. 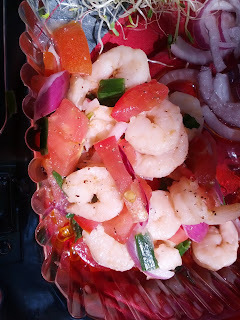 The entire thing was fresh and light, with tomatoes, red onion, chives. I liked this one, my second favorite, and I'd get it again if I was nearby and needed something simple. $7.59/lb was a tiny bit high, but not bad for seafood. This looked like the broccoli crunch salad from Whole Foods, which I always absolutely love. 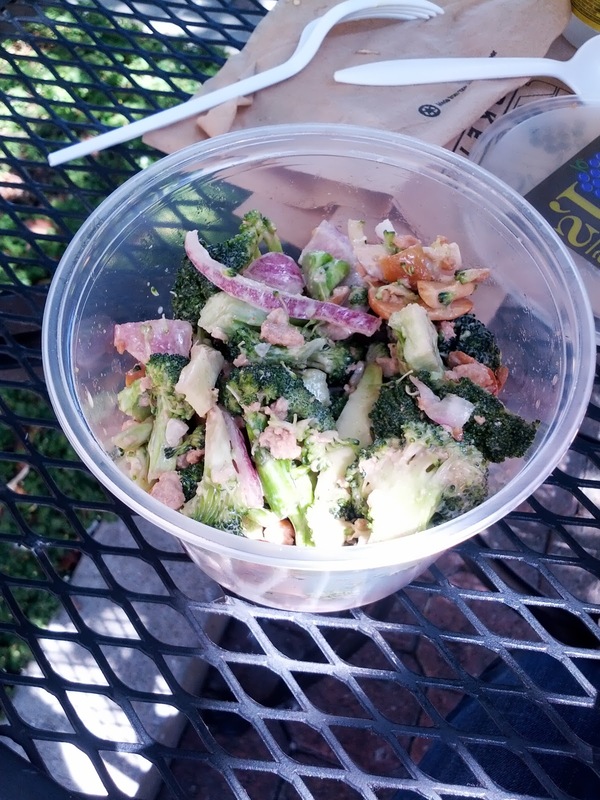 In fact, the ingredients are almost identical: brocoli, red onion, cashews, and bacon, in a creamy dressing. Except, in this case, the bacon is vegan. And I think the dressing must be too. The brocoli was nicely cooked, still crunchy. Like the Whole Foods version, I liked the red onion and cashews with it. But ... the vegan bacon? So strange tasting. I have nothing against fake meat proteins, but I didn't like this. The dressing also wasn't as creamy as the Whole Foods one. Basically, it just made me want the Whole Foods one! Second to last favorite, I wouldn't get again. Priced the same as the first salad, at $8.49/lb, which again seemed a bit high, but it did have the specialty vegan ingredients. 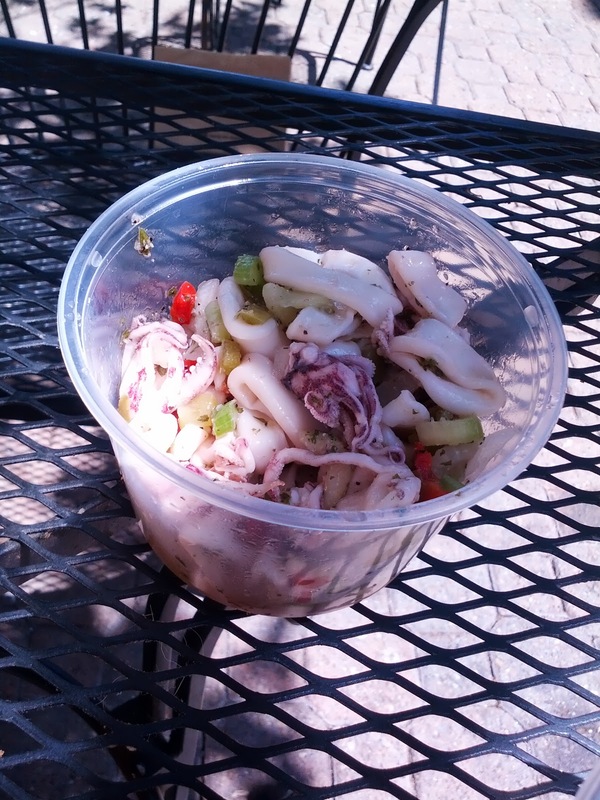 This calamari salad, featured both bodies and rings, along with celery, and peppers. Light and refreshing. The calamari bodies were nicely cooked, not rubbery, but a bit fishy. But the rings were very chewy. I didn't like this, and I wouldn't get it again. The price per pound on this was a whopping $16.99, making this small container $9. Definitely not worth it. 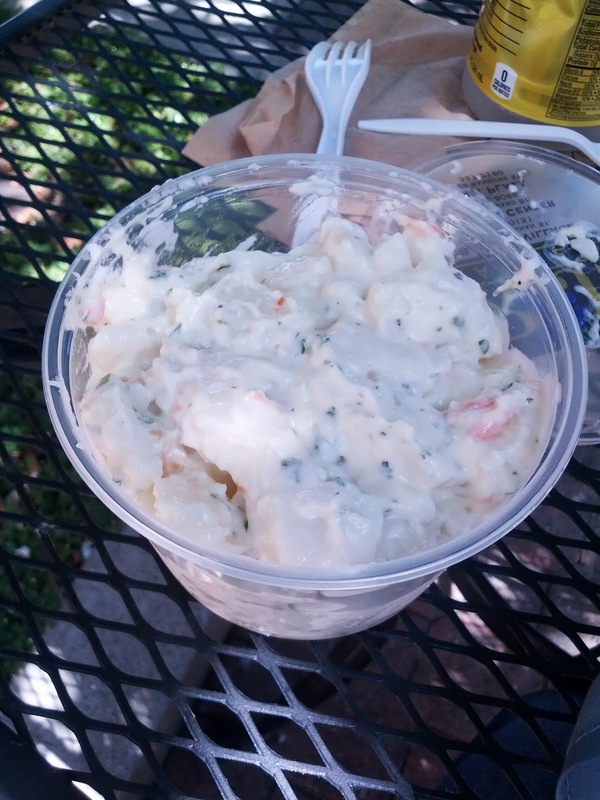 San Francisco Potato Salad. $4.49. Next, a classic potato salad. I love potato salad. No egg. Very creamy dressing, lots and lots of mayo. The potatoes were in really nice size chunks and were well cooked, not too mushy, not too crisp. But, I didn't really like something in the seasoning. I'm not sure what it was, but this wasn't a winner for me, and I wouldn't get it again. Priced at only $4.49/lb, which seemed totally reasonable. Jane's Honey Mustard Pasta Salad. $6.49/lb. I was told by the guy at the deli that this was his absolute favorite of their salads. 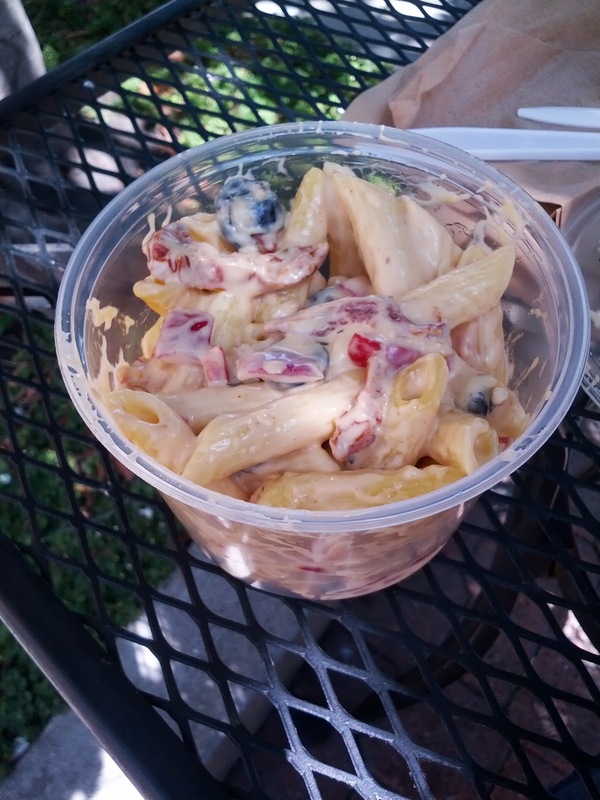 Penne pasta, sundried tomatoes, black olives, in a creamy dressing, again mayo based. I didn't really taste a strong honey mustard flavor, but there was a slight sweetness, which I liked. I again appreciated the sundried tomatoes. But, like the potato salad, it was over dressed. The tubes were full of dressing, so you'd often bite into one and a mouth full of mayo would squirt out. I like mayo dressings, but blech. Once I squeezed out some of the dressing, it was my third favorite of the salads, but I'm not sure I'd get it again. I also really love coleslaw. 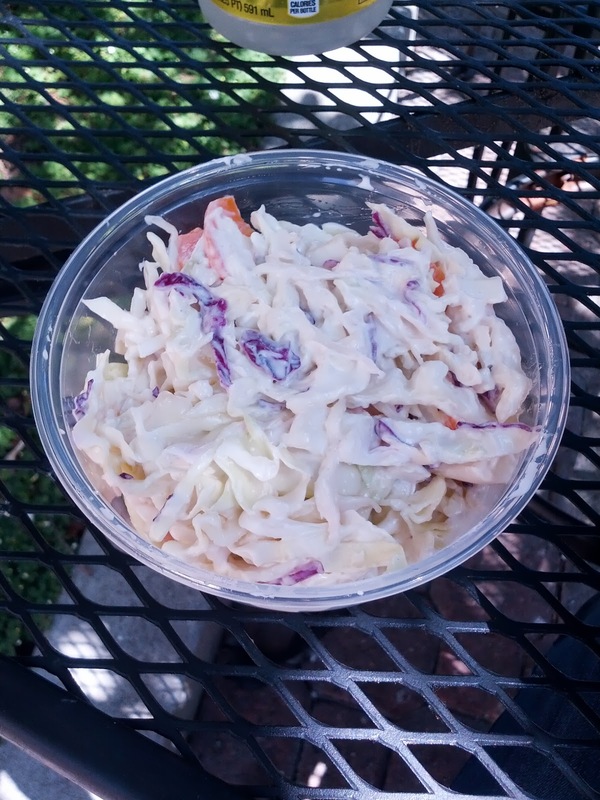 Classic coleslaw. Really crisp cabbage, in assorted size chunks. I was impressed by how fresh and crispy it was. Creamy mayo based dressing. Very, very dressed, but I liked it. Not remarkable, but solid. My favorite of the salads, and I'd get it again if I was in the mood for some slaw. As you may have noticed, I really like Home Hill Inn. 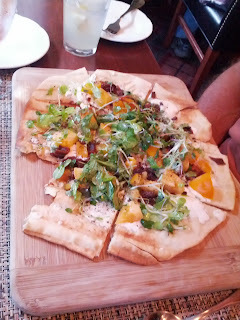 It is by far the best restaurant I've been to in NH, and rivals those in San Francisco. During my recent visit to see my family, I was determined to fit in as many meals there as possible, to experience the full variety of what they have to offer, since I'd only dined in the regular dining room before. So I went for a formal tasting menu with a group in the private room early on in my visit. I went for brunch a few days later. But I also wanted to check out their tavern (really, just a bar area, but they call it a tavern). The tavern features a large bar with seating, along with a few tables for 2-4 people. They don't take reservations for the tavern, you just drop in, and it is a more casual environment. You can order off the full dinner menu, but they also have a section of "Tavern Fare". And on Tuesday nights, they have live music. My last night in town was a Tuesday, and I was still really sad that I never got to have their fish & chips at brunch a few days earlier, so I somehow managed to convince my mom to go back to Home Hill for the third time, in less than a week. My dad agreed to join us, but it was clear he wasn't remotely interested, as he is most certainly NOT a foodie, and even the tavern fare was a bit exotic for him. But ... I have been wanting that fish & chips since I first read Home Hill's menu back in December, and tried to get my sister to go with me to the tavern back then, but she wasn't interested. And it was on the menu the night we did the tasting menu, but alas, not on ours (I know, I know, fish & chips isn't really tasting menu appropriate, but I've been wanting it so badly!). And it is normally on the brunch menu, but as I mentioned before, the morning we went, it was replaced with fried lobster. So I was determined to finally get my haddock before I left! When we arrived, I was a bit surprised that their was no live music. I asked our server when the music was suppose to start, and she said they had cancelled. Darn! It would have made for a fun atmosphere, but no worry, we were there for the food anyway. I almost cried when I saw the menu. It seems that Tuesday nights are completely scaled back. Their website actually says they aren't even open on Tuesday nights, so perhaps they are just experimenting with a smaller offering? The starters section of the menu and the flatbreads were about the same as when we were there the other night, but both the entrees and tavern fare options were greatly reduced. For tavern fare, there was only a burger, lobster roll, or bratwurst. NO FISH & CHIPS. So I was pretty disappointed, but I also knew that the other night they had some great sounding main entrees, like scallops. So I moved my eyes down to that part of the menu. It was shockingly short. And ... no scallops. No other seafood at all, other than the halibut dish that I had already. I was pretty devastated. The lack of live music and menu disappointment turned out to be just the start of a string of disappointments throughout the evening. Everything about the food was almost the polar opposite of what we had experienced on all of our previous visits. I've raved in the past about the amazing execution of everything - the fish, the vegetables, the sauces, everything was just so well done before. Everything was expertly seasoned. None of that was true this night. The only shining star goes to our server, who was really friendly and nice, even when I was asking annoying questions, like "Are you sure you don't have any fish and chips? Or scallops?" She did tell me that seafood delivery day is Wednesday, so that is why there wasn't any other seafood. She even noticed that we looked a bit cold, and quickly offered to cover up the AC vents (with menus - genius). Had this been my first visit to Home Hill, I would never return. If someone asked me to go back, I'd suggest other places. My previous visits have been such highlights however, that I do still firmly intend to return next time I am in town. I'd even still try the tavern, as I don't think it was being seated in there that was the issue. I'll just be very sure not to ever go on a Tuesday. It pains me greatly to write this review, and is perhaps the most tormented I've ever been reviewing somewhere. After we placed our order, we were brought the customary basket of house-made Home Hill goodness. At brunch, the basket is filled with seasonal muffins. At dinner in the main dining room, it is filled with fresh bread. Apparently, in the pub (or perhaps on Tuesday nights in general? 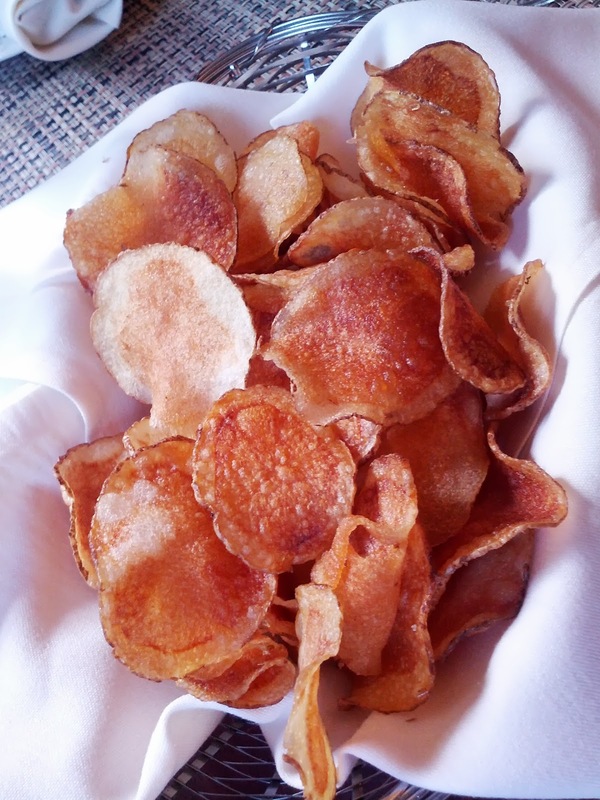 ), it is filled with chips. They were served warm, clearly fresh and made in-house, but very oily, and not really seasoned. I didn't like them at all, but my parents devoured them. My father, who never has anything to say about any food he tries, even commented on how they were better than the ones my mom normally purchases. I guess if you like plain chips, these were good? I dunno, I just don't ever eat plain chips, I prefer them flavored, or at least with a dip to dunk in. Cherry Pig: Cherry Heering Infused Whistle Pig Rye Bourbon, Muddled Cherries, Urban Moonshine Maple Bitters. $14. Since I wasn't all that enthralled with the wines on my previous visit, I decided to try a cocktail. Their cocktail menu was impressive, really creative sounding drinks, all blended with local ingredients (like the bellini I had at brunch!). 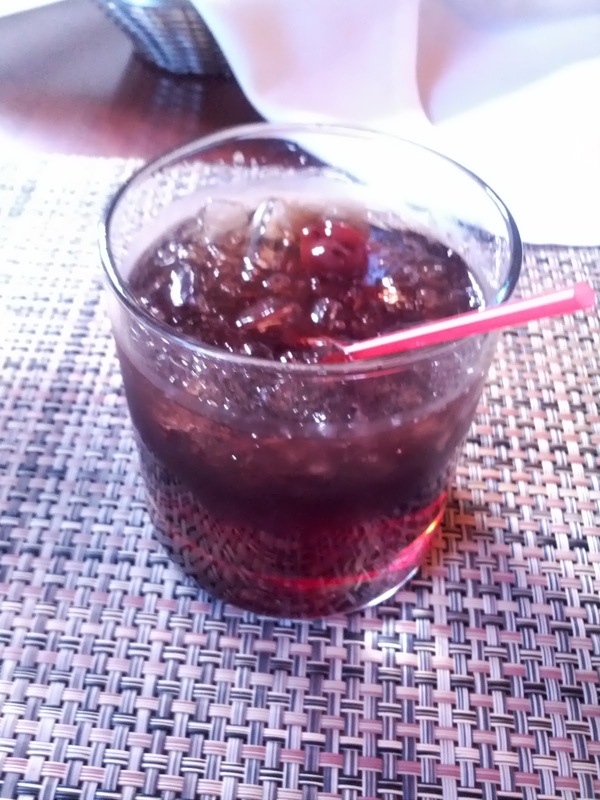 I was first drawn towards the sweet, fruity creations, but decided they wouldn't pair well with my meal, and I was sitting in a tavern, so a rye drink just somehow appealed. Like the rest of the drinks, it was made with local ingredients: the maple bitters and even the rye itself from Vermont producers. While I wasn't looking for a sweet drink, I was shocked by how NOT sweet this was. 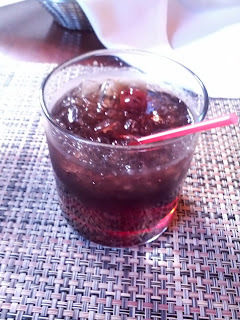 I expected the cherries and maple to impart some sweetness, but this really was an intense rye drink, and very bitter. The first few sips I didn't like very much, and I just pulled out my cherries and enjoyed them. As the ice cubes melted a bit, and I re-adjusted my expectations, it really grew on me. By the end, I was sad to have finished it. It was creative, good, and I enjoyed it, but I probably wouldn't order it again. The price seemed high, normal San Francisco prices even, which I didn't expect given how reasonable all their other prices are (food, wines, etc). Red Sangria: Pinot Noir, Orange, Grapefruit, Pineapple. $12. My mother also decided on a cocktail. I apparently was a very bad influence on her, as she commented that she drank more during my week-long visit than the previous six months combined. Whoops. Her sangria was fruity and sweet, about what you'd expect. A large size, justifying its $12 price. 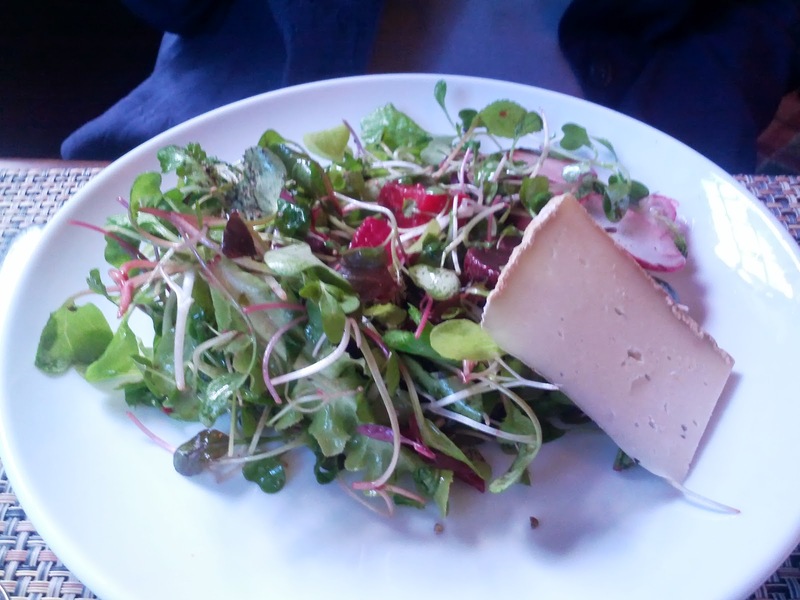 Roasted Heirloom Beets and Tender Greens Salad: Basil Vinaigrette, Easter Egg radish, Sheep's milk cheese. $9. As we were deciding what to order, we heard a guest at a nearby table ask, "Excuse me, is this the beet salad?" The server responded, "Yes, that is your heirloom beet salad". The diner than asked, "Well, then, isn't it supposed to ... contain beets?" I chuckled inside as the server whisked it away. I assumed there was just a mistake with their salad. My mom loves beets. She has been ordering beet dishes everywhere we've gone, so I wasn't surprised that she ordered this as a starter. Given the description, she expected beets to be prominent. They weren't. There were just a few tiny pieces of beet in the entire thing, along with a few shaved radish slices. It looked good to me though, mostly composed of the greens, which I expected to be fresh, crispy, and delicious, like the greens from our brunch dishes. So while she was disappointed, I was about to dig in, when she made it pretty clear that the salad was not a winner, and not even worth trying. She said the greens were all gritty, like they hadn't been washed. They were dressed with a vinaigrette that she said was really just heavy oil. And, she said the entire thing needed salt. I often pick on her for saying that things are TOO salty, saying she just doesn't have a "chef's palette", so it was striking that she thought it was under-seasoned. There was also a slice of cheese, just listed on the menu as "Sheep's milk cheese", we have no idea what kind it was, which is odd, given that they seem to pride themselves on listing all of their producers. My mom did not bother finishing this dish. Cheese Boa rd: Jasper Hill Bayley Hazen Blue, Spring Brook Farm Tarentaise, Crostini, Blueberries, Champagne Grapes, Honeycomb. $8 ($4 each). My dad, as I've mentioned, is a bit of a non-adventurous eater. All of the starters were too exotic for him, save the cheese board. On the menu, it listed "choice of local cheese", $4 each. He ordered the cheese board, and the server asked what cheese he'd like. He asked what they had ... and she realized we had no cheese menu. In fact, they didn't have a cheese menu anywhere. She left to go print one out somewhere. It took quite a while for her to return, and my mom had already received her salad by the time he was able to order his cheeses. My father also doesn't really know cheeses. He had no idea how to pick. I asked what he liked, and eventually garnered that he does like blue cheese and swiss cheese, so I selected the single blue cheese, and one that was listed as "alpine-style" for him. We had the blue, Jasper Hill Bayley Hazen, at our tasting menu a few nights earlier. It was about the same as that night. 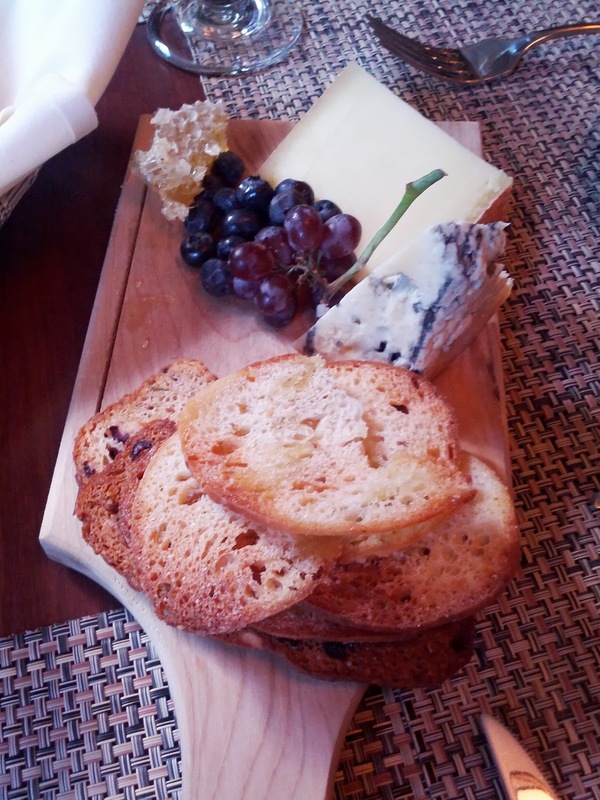 The other selection was from Spring Brook Farm, in Reading, VT, also a cow's milk cheese. It was nutty and firm, a decent cheese. For his sides, he received the same crostini, grapes, and honeycomb that we had, but he also was given blueberries. He doesn't talk much about food, so I don't really have a sense of how much he enjoyed this, but it was his first time trying honeycomb (which I made him try with the blue, since I loved it so much when I had it). He didn't like it. 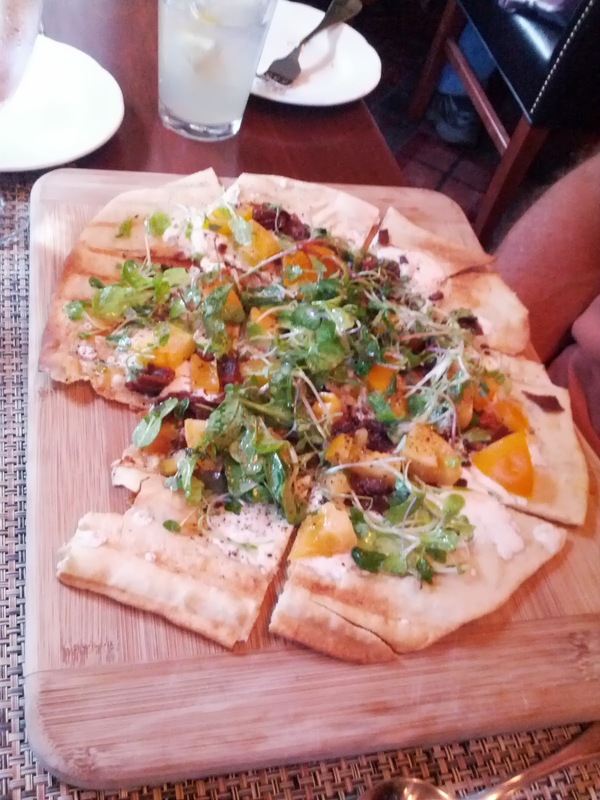 Local BLT Flatbread: Applewood bacon, garden greens, heirloom tomatoes, aioli. $15. For his main, my father stuck with a mashup of two things he knows: pizza and BLTs. Again, I don't have a sense of how much he liked it, as he wouldn't really say. I did try a few bites, and was impressed with how crispy the crust was, but overall, it was lacking much punch. The aioli had no flavor, so it was really just a crispy crust with a few chunks of tomato, the same greens that my mom had from her salad, and bacon, on top. The tomatoes were fresh and quite good, but they weren't enough to really make this pop. I liked the presentation on the bread board. Lobster Roll: shallot, garlic, celery, Meyer lemon aioli, fries. $19. As I've mentioned, my mother loves lobster. We had it a number of times during my visit, as she was thrilled to have someone else around to eat seafood with her, as my dad eats none. 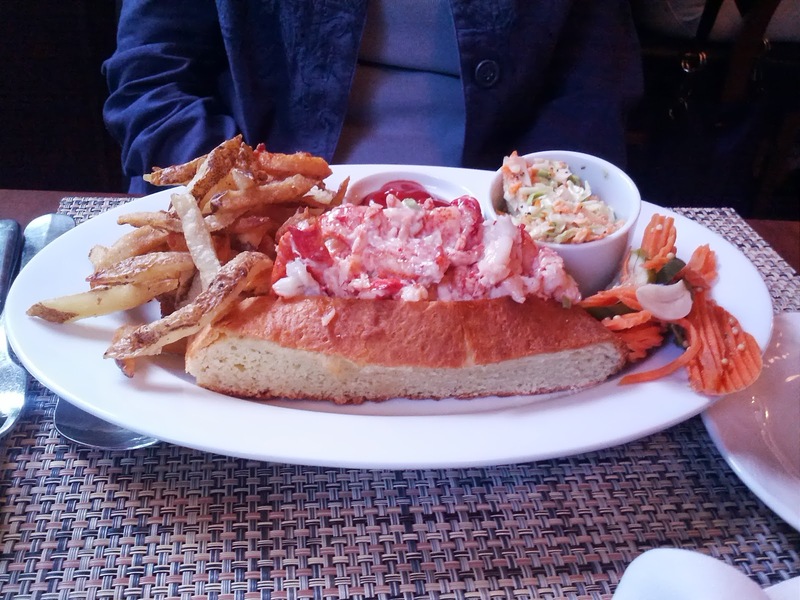 She has been talking about lobster rolls all week, so this was a no brainer for her. The lobster roll itself was fairly unremarkable, again, no real seasoning. There seemed to be too much bread for the roll, and it kinda fell aspart the moment she picked it up. She isn't carb-adverse or anything, but left behind huge chunks of bread. She said it masked all other flavors. We weren't sure where the meyer lemon aioli was, perhaps that was the light dressing on the lobster? It wasn't overdressed at least, but we were expecting aioli to dunk the fries in. Speaking of the fries, they were mostly cold when they arrived. Not just not warm, but stone cold. Well, most of them, a few were actually warm. Very inconsistent. Like the chips, really oily. They weren't listed on the menu, but it also came with slaw and pickles. The slaw had strong seasoning, unlike everything else we encountered that night, and it was crispy and fresh, but something wasn't right. The assorted pickles were good, not very vinegary. Overall, my mother did not like this. She ate the lobster out of the bread, but didn't find it to be that good. She left a huge portion of the roll untouched. She only ate a few fries, only a bite of slaw. She was quite disappointed all around. Veal Masala: Gnocchi, Masala wine, cultivated mushrooms, pecorino. $24. Speaking of disappointment ... I was there because I wanted seafood. As I mentioned, the main reason we were there is because they did not have the fish & chips when I went for brunch, but I knew the fish & chips were normally on their tavern menu. I was there for one thing only: fish & chips! And the only seafood option was the halibut that I'd already had. Perhaps I should have just gone for the halibut again, but given that it seemed like the fish wasn't fresh, I branched out. I asked our server about the veal. 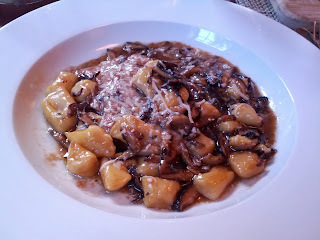 It had been years since I'd had veal, but I know that veal can be quite delicious, and I do love mushrooms and gnocchi. She raved about the dish, saying how tender it was. So, I went for it. I started with a bite of the veal. It was incredibly chewy, way, way overcooked. Tender is not a word I'd ever use to describe it. I was sad, but moved on to the gnocchi. It was unremarkable, not the kind I like that is seared on the outside and creamy on the inside, all just the same, mushy consistency. Mediocre gnocchi can be saved by a great sauce, but the sauce on this was actually the worst part of the dish. It was really just a huge pool of oil, with tons of soggy mushrooms in it. I was really upset with it, but kept trying a few bites. I moved on to eating my mom's cold fries, or my dad's banal flatbread, as I just didn't want anything to do with mine. I thought that perhaps I was just being a snob, or that it was just because I really wanted seafood that I disliked it so much, but my mom asked for some, since she didn't like her dish. I gave her a plate full, and she immediately remarked on how bad it was, saying that it was overdone, and just a pile of grease. She took one bite and pushed it away. This was before I gave my evaluation, so I knew it wasn't just me. At $24, this was one of their most pricy dishes, and it was certainly not worth the price. Way overcooked, insanely oily, just no redeeming qualities, at all. I was seriously sad after the entrees. It wasn't just that Home Hill wasn't living up to our previous experiences, it was really just not good. My mom proposed going out to ice cream to make up for it, but it was kinda cold out, so I decided against it. 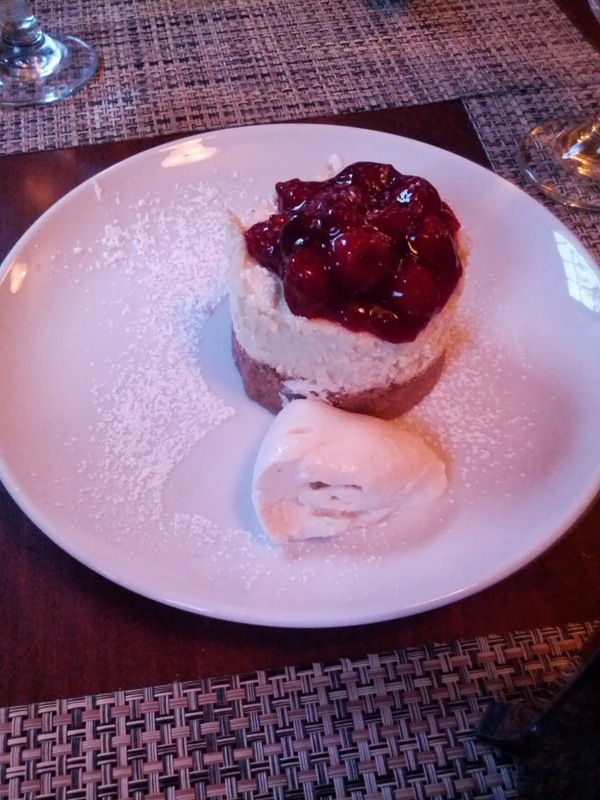 When our server mentioned that they had cheesecake, I perked up a bit. The cheesecake preparation was a cherry cheesecake, slightly different from the raspberry cheesecake from the tasting menu that I'd really liked a few nights before. So, we got it. It wasn't the same, at all. First, look at how thick the crust was. I think the ratio of crust to filling was about 60:40. So much crust! The crust was good, buttery, crumbly, but there was way too much of it. This version did not have the thin chocolate layer between the crust and filling. The filling was creamy, but didn't have much flavor. It really didn't seem the same as the previous one, at all. But overall, these components were all fine, just not as great as I expected given our prior cheesecake. But the worst part was the topping. 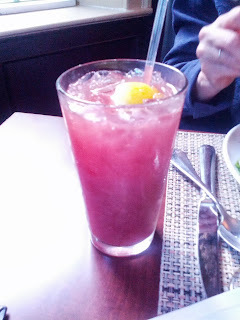 The previous one we had came with a delicious raspberry coulis. This was covered in what honestly seemed like canned cherries. Thick, sweet, not remotely fresh. Not pictured is the decaf coffee I ordered alongside my dessert. Like all of the coffee I ordered at Home Hill, it was quite good, individual french press style. Highlight of the meal for sure, and the only part of our dinner that was consistent with our previous experiences.